From the infinite imagination of #1 New York Times bestselling author Dean Koontz comes the suspenseful graphic novel debut of a natural-born hero with a supernatural twist. Based on Dean’s beloved character, Odd Thomas, IN ODD WE TRUST is a prequel to Dean’s Odd Thomas novels – ODD THOMAS, FOREVER ODD, BROTHER ODD and ODD HOURS. Odd Thomas is regular 19-year-old with an unusual gift: the ability to see the lingering spirits of the dead. To Odd, it’s not such a big deal. And most folks in sleepy Pico Mundo, California, are much more interested in the irresistible pancakes Odd whips up at the local diner. Still, communicating with the dead can be useful. Because while some spirits only want a little company. . .others want justice. When the sad specter of a very frightened boy finds its way to him, Odd vows to root out the evil suddenly infecting the sunny streets of Pico Mundo. But even with his exceptional ability—plus the local police and his pistol-packing girlfriend, Stormy, backing him – is Odd any match for a faceless stalker who’s always a step ahead. . .and determined to kill again? 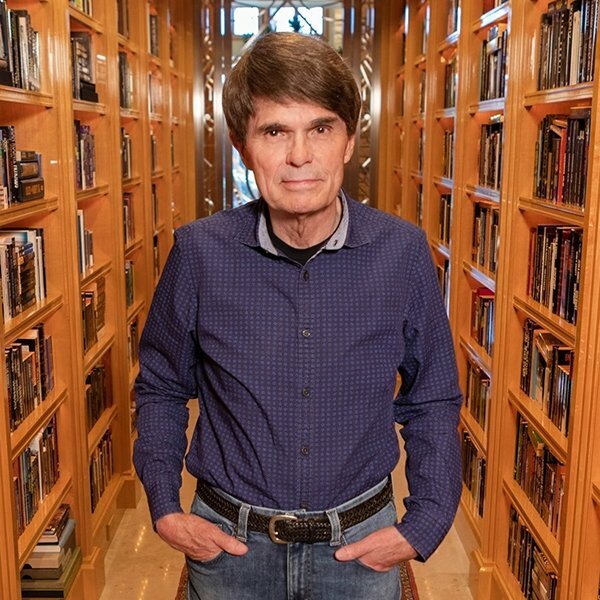 Dean Koontz is an international household name, a brilliantly gifted storyteller whose books have been bestsellers in many countries, selling seventeen million copies each year. Born and raised in Pennsylvania, he lives with his wife Gerda and their dog Anna in southern California. "Once in a very great while, an author does everything right--as Koontz has in this marvelous novel.... the story, like most great stories, runs on character--and here Koontz has created a hero whose honest, humble voice will resonate with many.... This is Koontz working at his pinnacle, providing terrific entertainment that deals seriously with some of the deepest themes of human existence: the nature of evil, the grip of fate and the power of love." --"Publishers Weekly" "Dean Koontz almost occupies a genre of his own. He is a master at building suspense and holding the reader spellbound." --"Richmond Times-Dispatch" "Dean Koontz is not just a master of our darkest dreams, but also a literary juggler." --"The Times" (London) "Once more Dean Koontz presents readers with a story and cast of characters guaranteed to entertain." --"Tulsa World" "From the Hardcover edition." When he was a senior in college, Dean Koontz won an Atlantic Monthly fiction competition and has been writing ever since. His books are published in 38 languages. He has sold 400,000,000 copies, a figure that currently increases by more than 17 million copies per year. Twelve of his novels have risen to number one on the New York Times hardcover bestseller list (One Door Away From Heaven, From the Corner of His Eye, Midnight, Cold Fire, The Bad Place, Hideaway, Dragon Tears, Intensity, Sole Survivor, The Husband, Odd Hours, and Relentless), making him one of only a dozen writers ever to have achieved that milestone. Fourteen of his books have risen to the number one position in paperback. His books have also been major bestsellers in countries as diverse as Japan and Sweden. Good Guy. Bad Place. Wrong Time.